The bobcat missing from the National Zoo since Monday morning has been found safe on zoo grounds, the zoo said Wednesday. Shortly before 5 p.m., the Zoo issued a press release about their find, including a photo of Ollie the bobcat in a cage. A visitor spotted the bobcat near the zoo's birdhouse and tipped off zoo keepers, zoo staff said at a news conference Wednesday evening. Zoo curator Craig Saffoe said the zoo then set traps in the area. "[We] crossed our fingers, walked away and literally within 15 minutes the birdhouse keepers called us back and told us, 'we have a bobcat in the trap up here,'" Saffoe said. 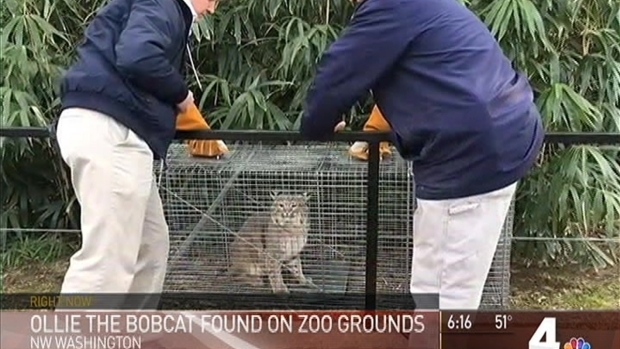 A bobcat who had been missing from the National Zoo for two days was found on zoo grounds. 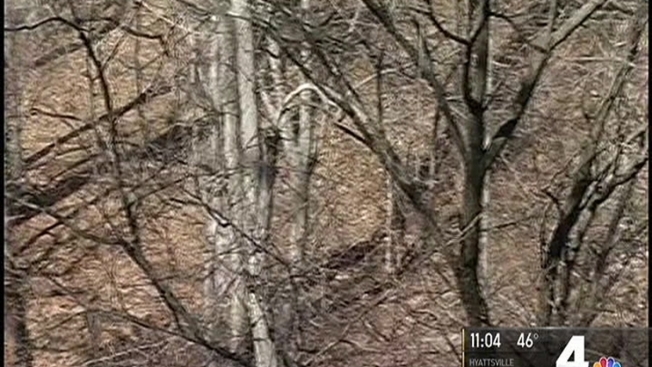 News4's Meagan Fitzgerald reports it was a zoo visitor that spotted the bobcat near a bird exhibit. Saffoe confirmed the bobcat in the trap was "definitely" Ollie. She appears to be well except for a minor scratch on her left front paw, said Dr. Brandie Smith, associate director of animal care sciences for the zoo. Saffoe said he believes Ollie followed Rock Creek when she left the zoo and the spottings on Massachusetts Ave. and other areas nearby probably were her. "I think she wanted to go out, have a little bit of fun, see what it was like on the outside," Saffoe said. But after a couple of days of roaming, "I think she was ready to come home," Saffoe said. Smith said Ollie will undergo a complete exam Thursday morning to make sure she's healthy and she didn't catch any diseases from other animals during her adventure. 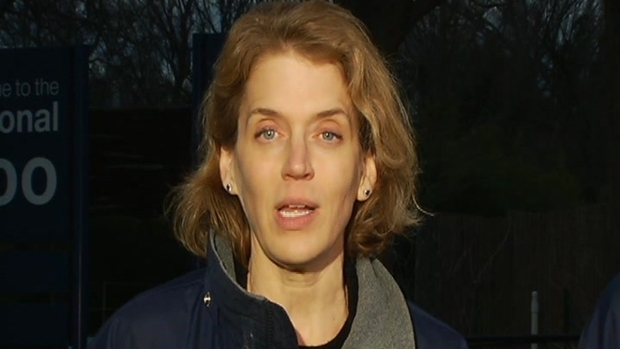 The Smithsonian's National Zoo hosts a press conference after they found Ollie the bobcat, who had been missing from a Zoo enclosure since Monday, on the grounds of the Zoo. Speaking is Craig Saffoe, curator of great cats, and Brandie Smith, associate director for animal care sciences. Zoo staff are also going through the bobcat exhibit with "a fine tooth comb" to try to find out how she was able to get out and Smith said they will make sure it's secure before they bring the animals back and reopen the exhibit. "The problem is it looks secure right now, so what can't we see? How was she able to get through that mesh?," Smith said. Earlier in the day, Zoo curators had said that they had stopped searching the northwest Washington neighborhoods of Woodley Park and Cleveland Park neighborhoods for Ollie, though they would continue to respond to tips about sightings of the animal. "We're entering the next phase of our recovery efforts," Saffoe said at the time. 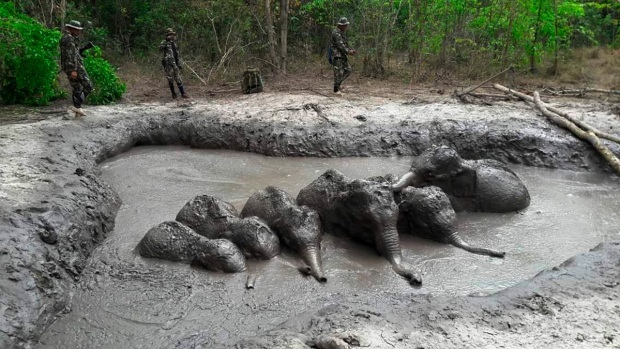 He said his nine-person staff needed to be realistic about how they can search for the animal, which is not known to be aggressive to humans. Ollie the bobcat has not returned to her enclosure at the National Zoo in Northwest Washington. Keepers first noticed she was gone on Monday morning. As News4's Meagan Fitzgerald reports, Ollie's disappearance is affecting area schools. "My staff works with lions and tigers, so I can't have them out at all hours of the night and then come back at 6:30 in the morning and work with dangerous carnivores," Saffoe said. Zoo curators said they were hopeful that Ollie would be found. They encouraged people who believe they see Ollie to call the zoo. Zoo staff had received a tip late Tuesday that the bobcat was spotted on Massachusetts Avenue. But by the time someone was able to arrive, the animal was gone. They had received mutiple tips about possible sightings of the bobcat in Woodley Park and Cleveland Park. As a result, more than a dozen schools moved activities indoors Tuesday, a D.C. Public Schools spokeswoman said. American University warned students about the bobcat in an emergency text message sent Monday. Neighbors said they weren't worried, exactly, just ... remaining observant. "I wish that it was in its cage, rather than roaming the streets of D.C.," said Drew Montmarquet, who was visiting the zoo Tuesday. Joey Jimenez, who lives near the zoo and in the area where Ollie was reported to have been spotted, said he was looking out while taking his small dog out on walks. "I was kind of alarmed, because I have to walk her out at nighttime," Jimenez said. Ollie, who weighs 25 pounds, was discovered missing Monday when a zookeeper went to feed the bobcats at 10:40 a.m.
Dr. Brandie Smith, associate director of animal care sciences for the zoo, said Monday that it looked like one of the ropes that holds the bobcats' mesh enclosure had broken. Smith said it didn't look like a deliberate act, but the break left a gap through which they believe Ollie was able to escape. Saffoe said on Monday that Ollie is a capable hunter and will be able to care for herself while on the loose. "Cats are... they're survivors. This is not like she's out in an area, in an environment that she can't survive," Saffoe said, noting that bobcats are indigenous to the D.C. area, although rare. Saffoe said Ollie was equipped to survive and that bobcats sometimes catch birds that land in their enclosure. He was not completely confident they will be able to find her. "We are doing everything we can to ensure that we can get her back. The likelihood that we get her back? I mean, I'd be lying to you if I said that we're definitely going to get her back," Saffoe said. He said it was more likely that Ollie would return to her enclosure on her own. Smith said zookeepers train for "events like this," so they immediately began a search after discovering Ollie was missing. However, they quickly changed tactics out of fear that they could end up scaring her away. "We actually created a bigger perimeter search so that any looking would drive her toward her exhibit," Smith said. Ollie has a chip for identification purposes but not a tracker. She was born in the wild and is close to 7 years old. "There's food, there's shelter, there's warmth at her exhibit," Smith said. Bobcats can run up to 30 mph and are excellent climbers, according to the zoo's webpage on the animal. At the zoo, they eat prepared meat, mice, rats and chicks. In the wild, they eat rabbits, hares, squirrels and mice. "She is a carnivore, so for small birds, small animals in the area, which could even include small cats and dogs, she could be a threat," Smith said Monday. "I would treat her the same way that I would treat a stray dog. You wouldn't approach a stray dog. And she's the same thing. She's not a threat unless you become a threat to her." The most recent animal to escape the zoo was an agouti, which is a small mammal, in July 2015, a zoo spokeswoman said. The agouti escaped from an exterior habitat but was found on the walkway and was easily recaptured, she said. In 2013, a red panda named Rusty famously escaped from the National Zoo. 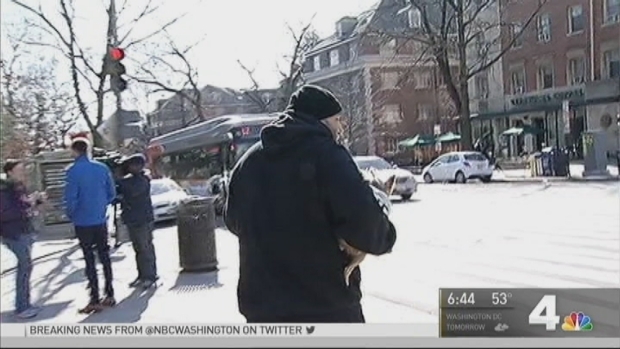 He was recaptured in D.C.'s Adams Morgan neighborhood the following afternoon. A resident, Ashley Foughty, spotted Rusty and tweeted pictures that helped keepers find him in a tree. Zoo officials said Rusty likely escaped the zoo by "climbing across a 'bridge' created by rain-laden trees and bamboo" -- and he probably did it for a snack of some nearby bamboo, they said.